Exercising doesn’t always require a gym! Studies have shown that low-impact exercise routines can help to benefit your health by stretching and strengthening your muscles, reducing stress, preventing injury and even helping to lower your blood pressure! Typically falling into four categories: endurance, strength, flexibility and balance, our recommendation is to find exercises that cover at least two or more of the listed categories for best results! Don’t know much about exercise? Don’t worry, we’ve got you covered! We compiled a list of exercises to help you improve your health and we shared them below! Improving not only your endurance, but also your flexibility, swimming is a very beneficial low-impact exercise for seniors. Since the water relieves stress on your bones and joints, swimming carries a lower risk of injury than many other endurance exercises while still conditioning your whole body as you move through the water. When you swim laps in the pool, you’re simultaneously stretching and strengthening the muscles in your back, arms, legs and shoulders. If you’re already an avid swimmer, we would recommend trying out different strokes to help keep your routine fun while also working out different muscle groups each time! 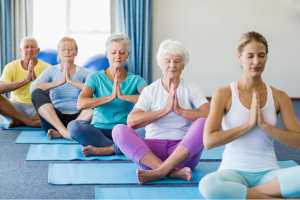 While you’re likely envisioning a room full of people whose bodies are contorted into impossible positions your body would never be able to abide to, you’d be surprised to know that more and more gyms are beginning to offer senior’s yoga classes! If you can’t find one, beginners yoga classes will do just as well! While you may only begin with positions basic positions (that aren’t nearly as intense as the one’s others may be performing), know that your body is still reaping all the great benefits of yoga! Believe it or not, yoga fulfills all of the categories of good exercise, combining endurance with stretches, strength training and balance. Pretty impressive, huh? Combining cardiovascular exercise with strength training for a low-impact, full-body workout, water aerobics has become the stereotypical senior workout – but with good reason! By exercising in water, you take advantage of the water’s resistance to strengthen your muscles as you move. Like with swimming, the water takes stress off of your joints and allows you to build strength and endurance with very little impact. Fortunately, contrary to popular belief, you don’t need to be able to swim to participate in water aerobics classes. Most of these classes are held in shallow water — between waist and chest deep — so you can rest assured that swimming is not a requirement! Much like yoga, this meditative exercise flows slowly from pose to pose and is a low impact exercise. Gentle on the joints, Tai Chi is perfect for seniors who have knee, hip or ankle pain! This low impact exercise focuses on breathing techniques which help to improve concentration and reduce stress while the slow, flowing movements tone and stretch the muscles. The best part about Tai Chi is that this exercise doesn’t require any special equipment or clothing! Don’t wait up! Start improving your balance, strength and flexibility with Tai Chi by taking a class or two at your local gym, community center or dedicated tai chi studios near you! While it might not seem like a low-impact exercise, cycling is actually very easy on the joints since your body absorbs minimal shock from pedaling. Using stationary bikes at the gym or road bikes you may already have at home, simply take some time everyday to pedal around your neighborhood! Cycling can improve one’s health by easing arthritis pain, help with high blood pressure and even improve one’s mood! A recent study even found that cycling reduces the risk of heart attack in people over 60! Pretty amazing, right? Let us know which one of these exercises you want to try! We can’t wait to hear about all the positive changes and benefits you’ll be gaining in the coming months! At Skilled Therapies, our mission is to help seniors effectively improve their quality of life! If you or a loved one need help getting back on their feet, know that our staff would be happy to help! Simply give us a call at 925.271.9100 or feel free to drop by one of our 6 convenient locations today!